In this lesson, you will learn how to use Jupyter Notebook to run Python code and render Markdown text in existing Jupyter Notebook files (.ipynb) . Be sure that you have completed the previous lessons on Intro to Shell and Get Files from Github.com. This notebook is available in the ea-bootcamp-day-1 repository that you cloned to earth-analytics-bootcamp under your home directory. Share your work with colleagues so they can see both your code and the code outputs. Document all aspects of your workflow using a combination of well written programming code (e.g. Python) and Markdown text. This functionality supports open reproducible science by facilitating and supporting collaboration and documentation. The Jupyter Notebook IDE The Jupyter Notebook interactive development environment (IDE) is the web application that launches in a web browser like Firefox or Safari and is the environment where you write and run your code. Kernels A kernel runs your code in a specific programming language. Jupyter Notebook supports over 40 different languages. In this class, you will use Python. Jupyter Notebook also provides functionality for making the coding process more efficient such as keyboard short-cuts as well as auto-complete options using the Tab button. You will review this functionality in the hands-on activity. Markdown is a human readable syntax for formatting text documents and can be used to produce nicely formatted documents including .pdf files and web pages (e.g. .html files). When you format text using Markdown in a document, it is similar to using the formatting tools (bold, heading 1, heading 2, etc) in a word processing tool like Microsoft Word or Google Docs. However, instead of using buttons to apply formatting, you use syntax such as **this syntax bolds text in Markdown** or # Here is a heading in Markdown. Markdown allows you to format text - such as making headings, italics, bold, and bulleted lists, - add hyperlinks to websites (e.g. URLs), make tables, and more. In fact, this webpage that you are looking at right now (and all of the hands-on exercises in this course) use Markdown for formatting! Using Markdown within Jupyter Notebook provides an easy and visually-appealing way to document your code’s workflow, provide details on your data, and describe your output and results within a single Jupyter Notebook file (.ipynb). Data Tip: Learn more about Markdown. How Jupyter supports open reproducible science through combining programming code, displaying output, and documentation with Markdown. In this lesson, you will review how to use Jupyter Notebook and the functionality that it provides for documenting open reproducible science. First, you need to know how to open Jupyter Notebook, which is done in the Terminal. It is ideal (but not required) to launch Jupyter Notebook from the working directory where all of the notebook files that you wish to use live. 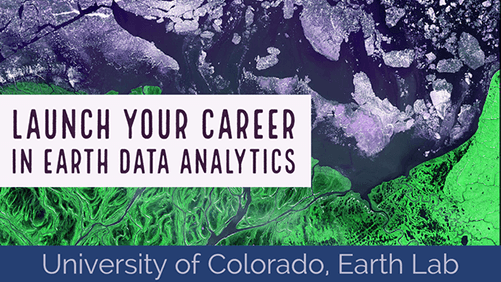 In this case, these files are in the earth-analytics-bootcamp directory. run the command jupyter notebook in the Terminal to launch Jupyter Notebook. IMPORTANT: the jupyter notebook command requires that you have Jupyter Notebook installed on your laptop! This was installed as part of the Anaconda installation that you followed as a part of the setup for this course. First, change the current working directory to earth-analytics-bootcamp under your home directory, and then check that the current working directory has been updated. Now, start a new Jupyter Notebook session by typing the command jupyter notebook in the Terminal. You can use Shell (Terminal) to open Jupyter Notebook with the command, Jupyter Notebook. When you type this command into the terminal, it will launch a local web server on your computer. This server runs the Jupyter Notebook interface. If everything works as planned, your default web browser will open with a new tab that displays your Jupyter Notebook environment. This is what the Jupyter Notebook dashboard will look like when you launch it. You will also notice that the Terminal is running commands to start your Jupyter Notebook session. Be sure to leave the Terminal open while you use Jupyter Notebook. It is running a local server for Jupyter Notebook so that you can interact with it in your web browser. This is what the Terminal looks like with a Jupyter Notebook session running. Data Tip: While Jupyter Notebook looks like an online interface, when you launch if from the terminal, like you did in this lesson, it is actually running locally on our computer. You do not need an internet connection to run Jupyter Notebook locally. To navigate in the dashboard, you can simply click on the name of a directory (e.g. ea-bootcamp-day-1), and the dashboard will update to show you the contents of the directory. You can click on the name of directory in the Jupyter Notebook Dashboard to navigate into that directory and see the contents. You can return to the parent directory of your Jupyter Notebook session (i.e. 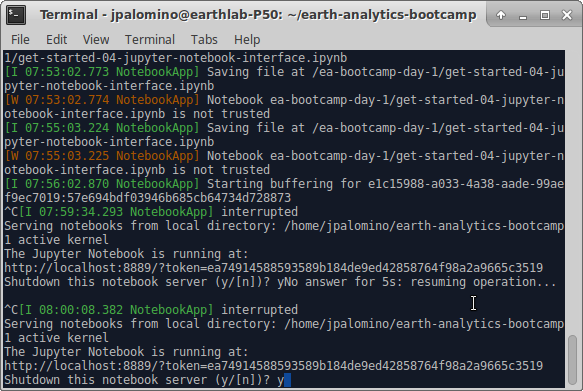 the directory from which you launched Jupyter Notebook; in this example, earth-analytics-bootcamp) by clicking on the folder icon on the top menu bar. You can use the Jupyter Notebook dashboard to return to the parent directory of any subdirectory. You can open existing Jupyter Notebook files (.ipynb) in the Jupyter Notebook dashboard. Note: if you don’t see the Jupyter Notebook file (.ipynb) or directory that you are looking for, you may need to navigate to another directory in the dashboard (see above). You may also need to launch the Jupyter Notebook from a different directory. Opening an existing Jupyter Notebook file (.ipynb) is as easy as clicking on the name of the file in the dashboard (e.g. filename.ipynb). The components of a Jupyter Notebook file include the Menu, the Toolbar, and Cells just like the ones shown here. You will review the menu and toolbar throughout this exercise. It is also important to understand how Jupyter Notebook files use cells to store and execute your code and text. A Jupyter Notebook consists of a set of cells, which can be specified to store text such as Markdown or Code such as Python. You can check the cell type of any cell by clicking in the cell and looking at the Cell Type in Toolbar. You can check the cell type of any cell in Jupyter Notebook using the Toolbar. The default cell type is Code. You can run any cell in Jupyter Notebook (regardless of whether it contains Code or Markdown) using the Menu tools (Click on Cell -> Run Cell) or Keyboard Shortcuts (Ctrl, then Enter). For example, you can run the Python code in the cell below using the Menu tools (Click on Cell -> Run Cell) or Keyboard Shortcuts (Ctrl, then Enter). Your result, or output, will be displayed below the Code cell that you run. You can run Markdown cells in the same way as the Code cells using the Menu tools or Keyboard Shortcuts. The difference between running a Code cell and a Markdown cell is that running a Markdown cell will not display results under the Markdown cell. Rather, when you run Markdown cell, you will see that the Markdown syntax has been converted to nice formatting. For example, the Markdown below is rendered from syntax for creating headings and titles using Markdown syntax: ## Text Follows the Hashmarks. You can double-click in any Markdown cell to see the Markdown syntax. To return to the formatted Markdown (i.e. rendered text), simply run the cell again. You can also use the Menu tools and Keyboard Shortcuts to create new cells. The default cell type is Code. You can change the cell type of any existing cell by clicking in the cell and selecting a new cell type (e.g. Markdown) in the cell type menu in the toolbar. You can change the cell type of any cell in Jupyter Notebook using the Toolbar. The default cell type is Code. You can change the order of cells within Jupyter Notebook using the up arrow and down arrow buttons on the menu bar. Simply click inside the cell that you want to move and then press the desired arrow as many times as you need to move the Cell to the desired location. You can use the menu bar in Jupyter Notebook to move cells within the Jupyter Notebook file. In addition to running individual cells within a Jupyter Notebook, you can also run all of the cells in consecutive order using the Menu. Sometimes, you may want to clear any output results that have been produced. You can do this using the Menu by clicking Cell -> Current Outputs -> Clear. This will clear the current cell that you are working in, which you can activate by clicking in a cell. You can also clear all of the output in a file by clicking Cell -> All Output -> Clear. You can save Jupyter Notebook files (.ipynb) using the Menu or Keyboard Shortcuts. When using the Jupyter Cloud environment, you can download Jupyter Notebook files (.ipynb) to our computers using the Menu by clicking File -> Download as -> Notebook (.ipynb). After saving your Jupyter Notebook files (.ipynb), you can close the browser tab displaying the notebook, but you still need Shutdown the notebook from the dashboard. To Shutdown a Jupyter Notebook file (.ipynb), click in the checkbox to left of the filename. You will see an orange button named Shutdown appear in the top left of the dashboard menu; click on it to Shutdown any file that is checked in the list. You can shutdown Jupyter Notebook files uinsg the Jupyter Notebook Dashboard. After all of your notebooks are closed and shut down, you can close the browser tab displaying the Jupyter Notebook dashboard. You will notice that the Terminal is still running commands for your Jupyter Notebook session. You can shutdown the session by clicking in the Terminal window and clicking Ctrl + C.
Last, you will be asked to confirm that you want to Shutdown this notebook server (y/[n])?. Type y and hit Enter to confirm. Then, you can close the Terminal by typing the command exit. You can close the Jupyter Notebook Session from the Terminal. Add a Code cell and run the following Python code to determine which day had the most precipitation (i.e. the day of the greatest flooding) during the Fall 2013 flood in Boulder, CO, U.S.A.
You have now experienced the benefits of using Jupyter Notebook for open reproducible science! Without writing your own code, you were able to easily replicate this analysis because this code block can be shared with and run by anyone using Python. By the end of this course, you will be able to write your own code to conduct analysis and produce plots like these. 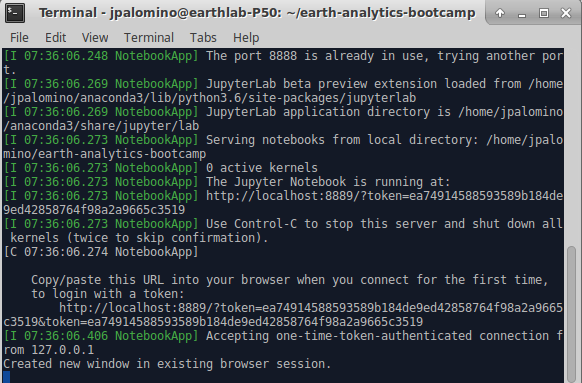 Launch Jupyter Notebook from the ea-bootcamp-day-1 directory. Open the existing Jupyter Notebook file called jupyter-notebook-interface.ipynb. Double-click in a Markdown to see the syntax. Run the cell to see Markdown return to the nice formatting. a smaller Markdown subtitle (###) with your name (e.g. Jenny Palomino). What do you notice about the output of 24 / 4 compared to the others? What operation does ** execute?